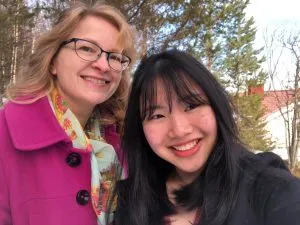 Chanamon from Thailand is an exchange student at Schildt High School in Jyväskylä, Finland. She wrote us about differences in school life and the most important thing – how to make friends with a Finn. “I had heard a lot about the Finnish school system even before I decided to come here. That it is one of reason why I chose to come to Finland. My first day at school the obvious difference I could see is how students dress up, I came from Thailand and I have school uniform, but in Finnish school there’s no such a thing. Students can wear what they want. What quite surprised me was students can decide their study plan by themselves with the student counselor. In Thailand students’ study plan based on their class, usually students will be in same class with same classmate for whole three years but in Finland it doesn’t go that way. Your classmate are likely to be change all the time in each course. My school days duration varies a lot – someday I have a quite short day and somedays I might be at school from 8am to 4pm. In one day, it can be maximum 5 classes and each class lasts for 75 minutes. I like the 15 minutes break during each class the most because I can pull myself together for the next subject or I can talk with my friends or make new one! The atmosphere in classroom is somehow more relax for me. Student and teacher are in same level. My first week in Finnish classroom I felt quite weird when other student just call teacher by name and speak with teacher the same way they speak to their friends because it is not something common to see in my home country. Technology is used a lot in here. In my school we use books and traditional notebooks. It was a new experience to do school work and tests online. What I like the most about technology that involved in school was website called “Wilma”, I can see my schedule, send messages to teacher and teacher can send me a message and I can see upcoming test. It makes life easier! I also heard a lot about ‘In Finland there is no homework’ and I found out it is not all true nor all false. Teacher may give you some homework to do but it is your responsibility if you are going to do it or not. For example, in my math class, teacher will give a paper in the beginning of the course which you can mark down after you have done some work. The first time I was informed that exam week in here will be 1-2 exams per day, it surprised me. In my school we usually have at least 4 exams in one day. In Finnish school, one exam takes so long time and I think it’s because they need to write down an essay. For example, in my English exam there are multiple choices part, fill in the blank part, listening part, reading part and one essay. About making friends in school, before I came here I searched ‘Finnish people’ on the Internet and what I found was Finnish people are cold and they don’t talk much. I have heard from my oriental camp that ex-exchange student had hard time making friends in here. I was a little bit freaked out because I’m not so good at socializing and I’m a super shy person. But lucky me, in my school there was one course called the Flash course. It was a course about getting to know Finland and Finnish people. All exchange students were there and there were also some local students, so I had some friends! My first week in one class which I was alone without any other exchange students, I was so scared. I couldn’t understand what I need to do (the teacher was helping me, but she can’t do that all the time) and I didn’t know anyone in that class. I gathered up my courage and asked the girl sitting next to me. She helped me out for the rest of the course. Actually, not just her but some other students too. Finnish people might not look so smiley and friendly but when you ask for help they are so kind and ready to help you. My tip is to take the first step and reach out to them. My view about Finnish people has been totally changed after I encouraged myself enough to take first step and ask for help. In some classes, teachers will let us work in pairs. It’s so good because I can talk to new people and make new friends! It is really helpful. And the last thing I’m going to talk about school life in Finnish school is lunch! It is another thing that differs from my high school in Thailand. In my school, I need to buy food in the cafeteria and there are quite many options to choose from. In here, the school lunch is a buffet. School lunch includes salad every day and it also includes a vegetarian option. And about food, so many of my friends are vegan or vegetarian or some are trying their best to reduce using red meat products. I am so impressed by that because the most common reason which made them do that is climate change. In my school, it not so common topic yet so students do not really concern about that. Host-äiti bloggaa: Miten suomalaisessa lukiossa saa kavereita?